Opening in 1904, the London Coliseum is the West End’s largest theatre, designed by prolific theatre architect Frank Matcham. With a grand, Italian Renaissance façade and equally lavish interior, the impressive building has hosted a number of stars over the years and is home to the English National Opera and Ballet. With an impressive seating capacity of 2,359, the London Coliseum is split across four levels, including the Stalls, Dress Circle, Upper Circle and Balcony. A variety of views are on offer, with the best views located in the Stalls and front of the Dress Circle. Due to the vastness of the theatre, seats in the higher tiers and at the rears of each section may feel distant from the stage. Check out our seating price chart, which details the type of view you will get for the price you pay. Please note that prices dramatically vary depending on the production on at the time. Below is a rough guide that should be able to assist you. For an accurate price, please visit the London Coliseum’s official site. 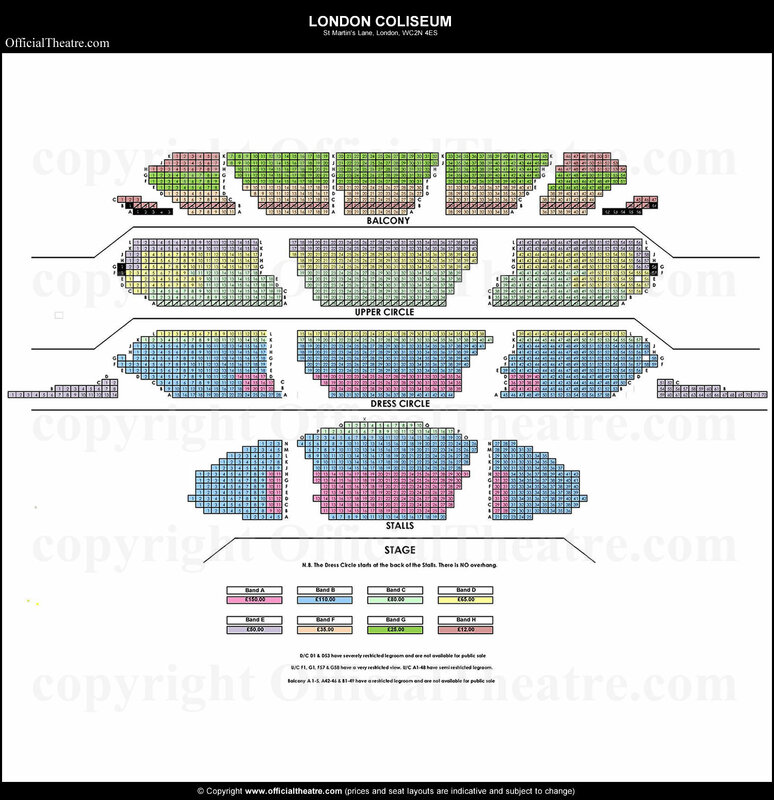 Band A (£150.00) Premium seats are located in the centre of the Stalls, roughly seats 10-32 of rows B-H. These seats offer the best views in the theatre; head-on to the stage with no restrictions. Seats in the centre of rows B-D, roughly 14-40, are premium priced, due to the exceptional view of the stage. There is a head-on view here with zero restrictions. Not available. Not available. Band B (£110.00) The majority of the Stalls are this price, as you are guaranteed an excellent view of the stage no matter where you are sat. A gradual rake ensures you can see past those in front, and there is plenty of comfort and legroom and the Dress Circle does not overhang. Most of the Dress Circle falls under this price, as a decent rake ensures you can see past anyone in front of you and have a direct, head-on view of the stage. Seats in the Dress Circle are a good option for large-scale productions. Not available. Not available. Band C (£80.00) Rows P-Q fall under this price as they are distant from the stage and it may be difficult to make out detail. There is no obstruction as the Dress Circle does not overhang. Row K is this price as it begins to be affected by the Upper Circle overhang, which cuts off the top of the stage and can affect productions. The stage may feel distant from here and it is difficult to make out detail. Most of the front of the Upper Circle falls under this price, as there are good, unrestricted views from here. The stage may feel distant and it could be difficult to see facial expressions. Row A is restricted by the safety rail. Not available. Band D (£65.00) Not available. Row L falls under this price as it is severely affected by the Upper Circle overhang, which cuts off the top of the stage. This can be problematic for some productions. Detail is also difficult to make out from here. Rows G-J and seats toward the ends of rows C-F are all this price, due to the fact that detail is difficult to make out from here. There are minimal restrictions, but the stage feels far away and the Balcony overhangs too. Not available. Band E (£50.00) Not available. Seats at the very far sides of rows A-C and are similar to slip seats, as they curve dramatically around the stage. This can result in side views of the stage, which may require you to lean forward to see the stage. Rows K-L of the Upper Circle are this price as the Balcony overhangs and cuts off the top of the stage. The stage is incredibly distant and it is difficult to see detail from here. Two seats either side of rows G-J are this price, as the stage is distant and the seats face the stage slightly side on. Not available. Band F (£35.00) Not available. Not available. Not available. The front half of the Balcony is this price as although there are no restrictions, the stage seems very far away and it is difficult to make out detail. Please note that legroom is limited in this section. Band G (£25.00) Not available. Not available. Not available. The back half of the Balcony is this price due to limited legroom and the fact that the stage is distant, therefore it is difficult to make out any detail. Band H (£12.00) Not available. Not available. Not available. There are minimal seats at this price, but they can be found in Row B of the Balcony, where a safety rail completely restricts the view. Seats in the rear corners of the section are also this price as they are distant from the stage, side on and partially restricted. Day Seats Not available. Not available. Not available. Not available.